Thursday, 24 April 2014: One Year, Three Weeks and Two Days Old. Mum has been visiting for a week and while I’ve been at work she’s looked after Ayla in conjunction with Hubby who’s been on his rostered week off. 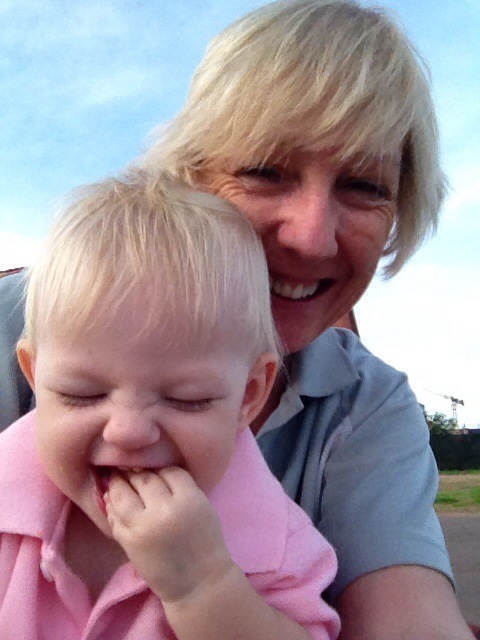 But today Ayla and her Grandma were on their own for the whole day – from 7.30am til 5.30pm. My mum hasn’t had anything to do with babies for 26 years, but over the past week she’s been able to recall her undying parenting skills and has aptly put Ayla to bed, fed her, changed her and played with her like she’s been doing it all along. But I think what had really resonated with Mum on this visit was that she’s been able to get to know Ayla in her own environment, and share in every day activities that she would normally miss out on due to distance. I’ve loved seeing Ayla and her Grandma spend quality time together , and my Mum’s great day with Ayla culminated this evening when Ayla took her first official steps! Ayla took just a couple of tentative wobbly ones but they were toward her Grandma and that put the icing on the cake for my Mum.